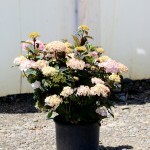 A mid-sized shrub that blooms with abundant 4" rounded heads of pink and cream flowers. 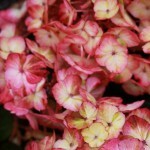 The blooms mature to shades of red and purple. 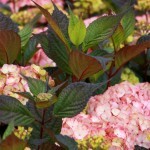 The foliage is a glossy dark green, infused with burgundy, turning burgundy in the fall. Stems are slender with dark purple tones. Grow in light to open shade in a moist, well-drained soil.